It is finally feeling like spring may have arrived in Minnesota. Warm enough that my boyfriend Eric and I decided to have a picnic in the park this week. It was wonderful to just sit and enjoy the sun's warmth, watch the loons swimming on the lake and dream up what the clouds looked like while we enjoyed each other's company and dinner. Although the weather is warming up, the one thing that is missing is the flowers! My favorite part of spring is enjoying the flowers popping up in people's yards while I go for my morning run. Seeing the crocus and daffodils pop up where there was previously just brown dirt is quite refreshing. Hopefully they come up soon, but until then I decided to make a flower cake to enjoy. I was not exactly sure where I was going when I started, but I wanted it to resemble a flower and have lots of delicious fruit flavor. I decided on a coconut lime cake, tinted green with spinach (you can't taste it) for the bottom portion. 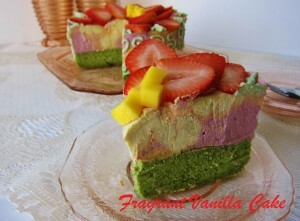 I then topped it off with 3 different fruit mousses, lemon, mango and strawberry, then swirled them for a tie dye affect. The colors reminded me of spring flowers as well. 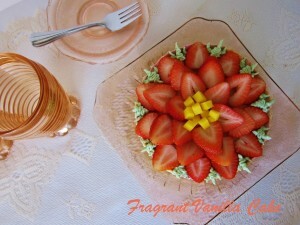 Lastly, I decided that it needed to have fresh fruit on top so I made a flower out of strawberries and mango. I showed it to Eric and he said "Whoa...I can't believe you made that! 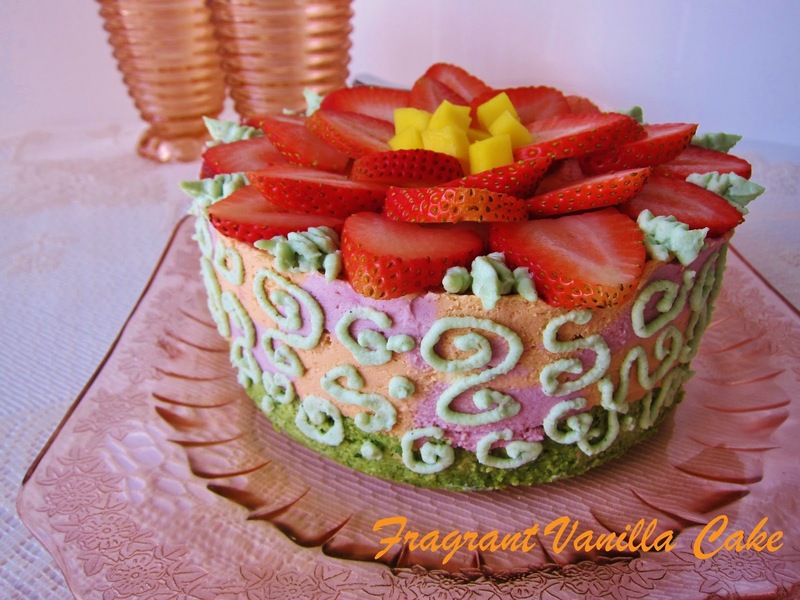 It is so pretty, visually my favorite cake you have ever made!" I was thinking...I decorate cakes all the time, and I had to laugh. I guess this one was special. 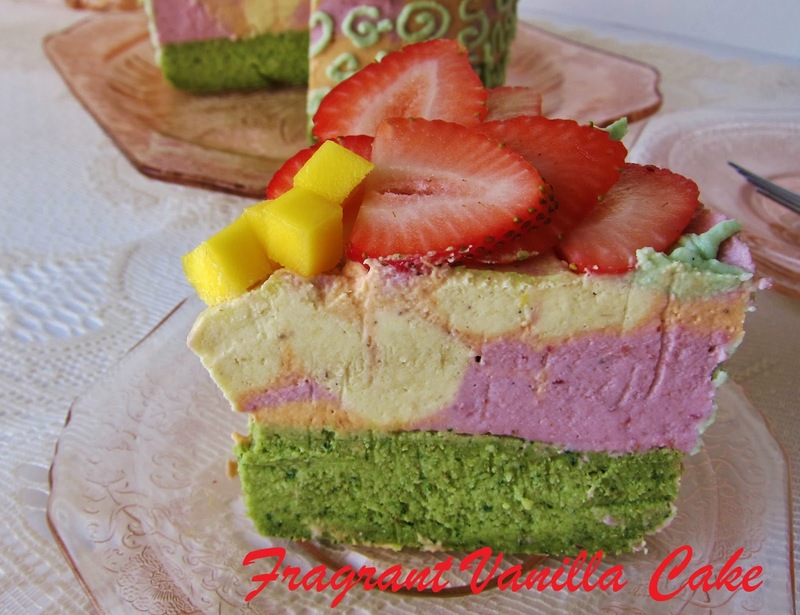 It tasted as good as it looked as well, like biting into a bouquet of fruit and cream. Hopefully the April showers will bring the May flowers, I am ready! Until then, I can enjoy my cake. Combine almond flour, coconut flour, sea salt, in a bowl and whisk together until and set aside. To a food processor, add the dates, vanilla, coconut lime juice and zest, coconut water, nectar and spinach to the processor and process until pretty smooth. Add the dry ingredients back and process until smooth and well incorporated. Place the batter on a teflex lined dehydrator sheet, in slightly larger than a 6 inch circle and dehydrate for about 8 hours, until dried but still moist in the center. Once dried, trim into a 6 inch circle, place in the bottom of a 6 inch springform pan (greased with coconut oil), and set aside. To make the cream topping, combine the cashews, coconut, coconut water, coconut nectar, sea salt, vanilla, vanilla bean, and process until smooth. Add the coconut oil with the processor running to incorporate it completely. Once blended, divide the cream mixture into 4 bowls and set aside. To the first bowl, add the lemon zest, juice and a pinch of turmeric to the bowl and whisk to blend. Add the second bowl of cream back to the food processor and add the 1/3 cup mango, a small pinch of turmeric and a small piece of beet and process until blended then remove back to the bowl. Add the third bowl to the processor and add 1/3 cup strawberries and the 1 Tbsp raw beet and process until smooth and well blended. Add back to the bowl. Add the 4th bowl of cream back to the food processor and add the spinach. Process until smooth and add back to the bowl and place in the fridge. To assemble the cake, drop the lemon filling, the mango filling and the strawberry filling by the Tbspful randomly over the lime cake in the prepared pan. Once the pan is filled tap on the counter to level and swirl with a knife (being sure to go to the bottom of the filling). Place in the freezer to set, about 3 hours. 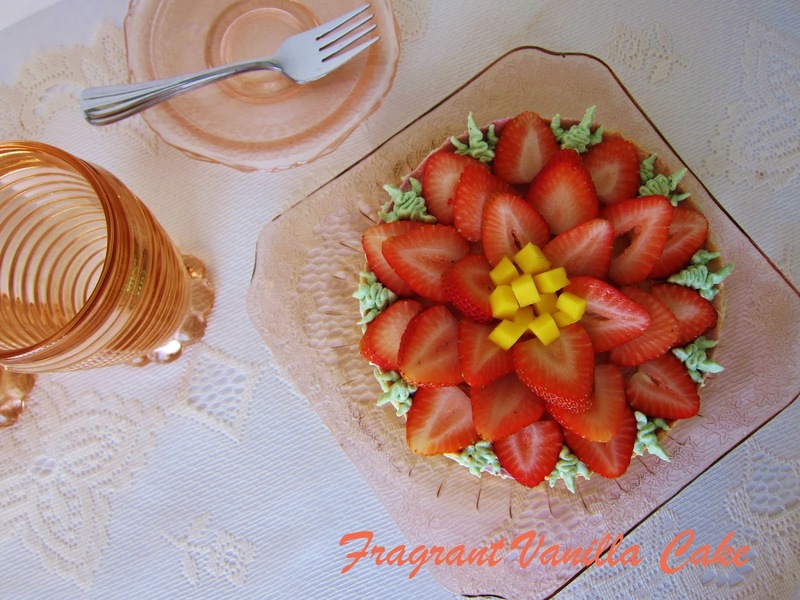 Once set, arrange the sliced strawberries on top of the cake to resemble a flower and place the diced mango in the middle. 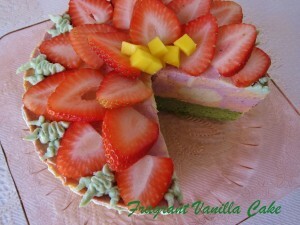 Place the green cream in a pastry bag (or a plastic bag with the end cut off and decorate the sides of the cake, creating leaves and vines. Serve! Store extra cake in the fridge. *If you cannot get fresh coconut meat, soak 2 cups dried coconut for 4 hours then drain. Continue with the cake recipe. **The beets and turmeric are for coloring the cake more vividly, but if you do not have them you can sub natural food coloring. Thanks so much Miliany :)! You are so sweet! I am happy that you visit my blog, hope you have a wonderful week :)! What I do, is I line the bottom with parchment and grease the bottom and sides. It comes out perfect every time :)! Thank you :)! You can have them too if you practice, and you don't need baking skills for this cake ;)! This is so gorgeous girl!!! Very springy, love those colors! Thanks so much Heather :)! 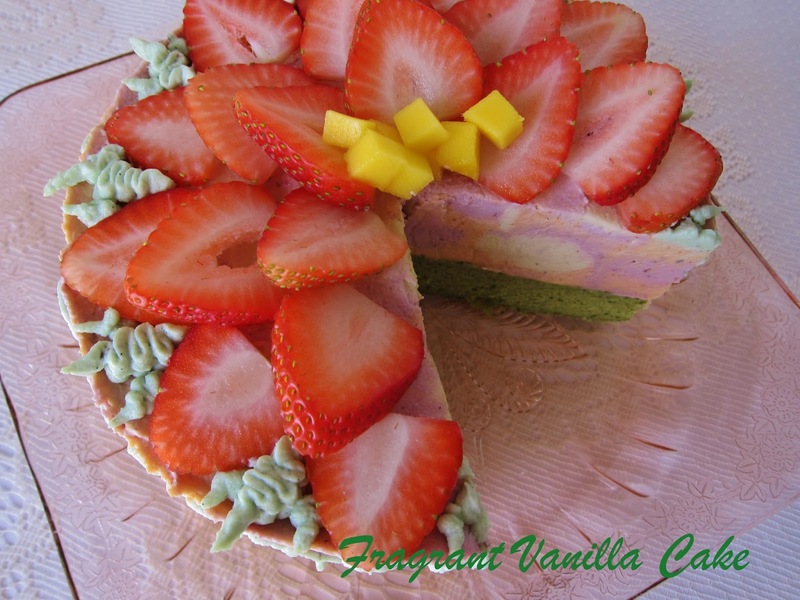 What a spring cake! So colorful and Beautiful. We are sure it tastes beyond delicious as well! Thank you :)! It was totally delicious! Thank you so much :)! I am happy to share with you! Thank you so much Sunnie :)! I think it would be too! 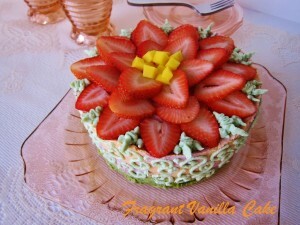 I am coming up with something special for my Mom, but I totally would make this again if it wasn't next weekend ;)! ALL your cakes are stunning...but it's so sweet that Eric singled this one out. It is gorgeous!. Yeah, I was shocked when my dad told me they had snow in Iowa last week...I'm sure you had it even worse in MN. Crazy. I'm ready for a heat wave! Thanks so much Liz :)! Yes, I am so ready for the warmth to be here for good! Hope you have a wonderful week! Well, follow the recipes, and dehydrate at 115 degrees and you will be fine :)! You should have many delicious things coming out of your dehydrator in no time. Not if you want it to still be raw ;). I would definitely recommend an Excalibur! I have a 5 tray and it was only about $165. Thank you :)!